Osteopathy is a gentle, effective therapy using hands-on techniques to diagnose and treat a wide range of health problems; aiming to relieve pain, discomfort and immobility. It aims to return balance to the body’s structure and function relating to muscles, bones, joints, nerves and how they all interact together. An osteopath will also provide advice on posture, stretching and lifestyle to further promote healing to take effect and prevent symptoms recurring. Assisting respiration, circulation, digestion and metabolism to occur optimally leads to an improvement in the patients’ health. The osteopathic philosophy is to treat the person as a whole, not just the specific symptoms. By improving the function of the whole body osteopathy helps to stimulate the body’s own self-healing and regulatory processes, aiding a return to health. A whole-istic treatment includes addressing the development of the patient’s attitudes and lifestyle that do not just fight pain or illness, but help prevent and resolve them. Your first visit to an osteopath will include a thorough case history, followed by an in depth evaluation of the structures of your body. The safety and precision of the treatment is ensured by the detailed medical history. A full body examination will be performed because it is important to assess the function and effect that all the structures, however distant, have on the painful area. An osteopath may initially focus on the musculoskeletal system (muscles, bones and connective tissues), which reflects and influences the condition of all other body systems. Practitioners help the body heal itself by initially diagnosing the cause and nature of the complaint and then using manual techniques to address the structures involved in the dis-ease, pain or illness. Osteopaths use their eyes and hands to identify structural problems that are preventing the body’s natural tendency toward health and self-healing. Treatment is adjusted to the requirements of the individual and is aimed at improving whole body function. 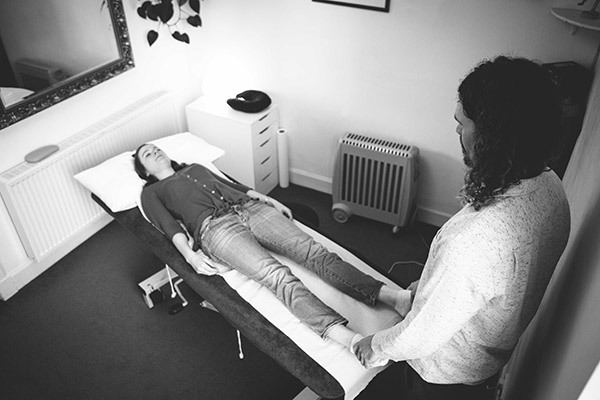 Before treatment an osteopath will explain to you their findings from both the case history and physical examination, helping you to understand the diagnosis. The osteopath will form a treatment plan with you. The basis for successful treatment lies in the art of palpation (touch) which in the hands of a skilful practitioner is effective, painless, exact and safe. Osteopaths are primary care providers, medically trained and can differentially diagnose. This involves examinations including the cardiovascular, neurological and respiratory systems and reading medical imaging such as X-rays and MRI scans. I offer a range osteopathic treatments that can help with back and neck pain, Sciatica, muscle and ligament injuries, headaches, joint pain, sports injuries, slipped discs, tendinitis and bursitis, trapped nerves and joint pain. Osteopathic treatment using the cranial approach is very gentle safe and effective in the treatment of babies and children and adults. A gentle form of manipulation to allow the function of the internal organs, or viscera. A safe and gentle form of Osteopathy that helps to restore normal function of the bodies systems that has to deal with the joyous strain of pregnancy.